Sneads Ferry is known for its commercial fishing industry that yields abundant fresh seafood. 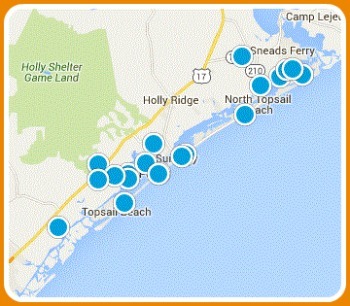 Beautiful coastal scenery and all the perks of waterfront living (opportunities for boating, sailing and watersports abound) plus the nearby beaches of Topsail Island make Sneads Ferry an increasingly popular place to call home. Sneads Ferry Real Estate includes a number of new home communities, incredible Intracoastal waterfront homes and well-priced starter or retirement homes. Searching for your Sneads Ferry dream home? You're in luck! We feature all available Sneads Ferry homes for sale in the MLS with the most current pricing, photos and property information available. You'll also find Sneads Ferry condos, waterfront properties, new construction and foreclosures for sale. Selling a Sneads Ferry home? Find out what your Sneads Ferry home is worth with a personalized property value assessment. Questions? Want to see a home in person? Contact us! Be the first to see new Sneads Ferry homes as soon as they hit the market! Register for Sneads Ferry new listing alerts.